Holstein Association USA is proud to recognize David Harvatine of King Ferry, New York, as the 2018 Distinguished Young Holstein Breeder. As co-owner and dairy manager of Aurora Ridge Dairy, Harvatine is living his dream of working in the dairy industry and breeding elite Registered Holsteins®. Aurora Ridge Dairy is located north of Ithaca, New York, in the heart of the Finger Lakes region. Started in the mid-1980’s by Bill and Penny Cook, Aurora Ridge Dairy has expanded from a 65-cow herd to 2,250 cows. Today, Aurora Ridge Dairy is owned by four partners: Bill Cook, Dan Westfall, Jason Burrows and Harvatine. With a strong desire for robust genetics, Harvatine enjoys studying pedigrees and browsing bull books. When genomic testing was introduced, Aurora Ridge Dairy dabbled with the idea and today they are using 100 percent genomic sires. Aurora Ridge Dairy’s rolling herd average is 34,000 pounds on three times a day milking. Currently, the cows are averaging 92 pounds of milk per day with 3.9 percent fat, 3.1 percent protein and a somatic cell count of 100,000. Knowing that milk is their number one income driver, Harvatine starts by using bulls +1,000 pounds for PTA milk. Components are also key in his decisions as he avoids choosing negative component bulls. “If I’m going to feed two cows, I’d rather feed one that makes the most milk and has longevity,” Harvatine says. Harvatine looks at genetics as a long-term investment. Harvatine also says he wants cows that are going to be structurally sound and visually impressive, so he pays attention to udder composite, PTA type, feet and leg composite, somatic cell score and daughter pregnancy rate. Adaptation of technology has been an important part of their operation. Aurora Ridge Dairy utilizes the many genetic and reproduction technologies available. His team uses Enlight® on a weekly basis to make informed donor selection decisions and to calculate which animals to sell. A key management practice for Harvatine is accurate identification. With less than one percent of genomic parentage errors, Harvatine says his team has found their groove. Harvatine and his wife, Leigh-Ann, have two children, Ava, 10, and Bree, 7. Harvatine is known as a man who is humble and enthusiastic, with a robust work ethic. Harvatine volunteers his time with several groups, including serving as a member of the local school board, and on the board of managers for Cayuga Marketing LLC, an organization consisting of 29 members who own and manage dairy farms in central New York. Always interested in continuous improvement, Harvatine is currently participating in the Cornell University Dairy Executive Program to advance his leadership and management abilities. The Distinguished Young Holstein Breeder award recognizes significant accomplishments of young Registered Holstein® breeders for their commitment to preserving the dairy industry and for achieving excellence in their daily lives. 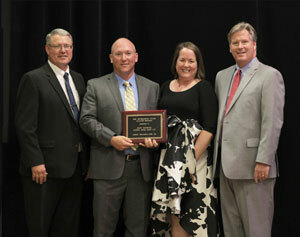 Harvatine was recently honored during the 2018 National Holstein Convention in Acme, Michigan.